Billed as a 'choral jazz concert drama', Lansky: The Mob’s Money Man composed by Roland Perrin was receiving its first public performance. The work traces the life of Meyer Lansky as a young Jewish boy in a pogrom affected Polish-Jewish settlement in the early 20th Century. Fleeing anti-semitism he becomes part of the Jewish diaspora to Lower East Side New York. Here, his genius for mental arithmetic leads to a meteoric rise within the ranks of the mafia making him the trusted ‘go to’ man for organising takings from gambling and extortion and sharing out the profits. Lansky’s journey then takes him to Havana, Cuba where he ‘organises’ legal gambling at the behest of President Batista making millions. However, history is at work and ‘his good fortune’ is reversed by Castro and Guevara’s revolution “you can’t do business with these crazy commies”. From here he turns to Israel where he hopes to find some kind of salvation but is denied citizenship only to return to the US where he lives out the remainder of his life in a retirement community in Florida. The work, which brought together the Crouch End Festival Chorus (CEFC), the Blue Planet Orchestra (BPO), a narrator, played by actor Allan Corduner, and Rachel Sutton as vocal soloist. draws upon and integrate multiple musical sources from 19th and 20th century classical composers to salsa, klezmer and jazz, creating music that is both cerebral and powerfully emotional. The scope of the music is breath-taking. Stand-out pieces, and there were many, included the East-European inflected Jerusalem, as a grandmother says goodbye to her grandson bound for New York, the easy swing of You Can Turn a Nickel into a Dime and the salsa-driven La Mulatta depicting a seething Havana. The performances were hugely impressive. 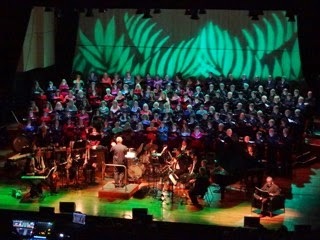 The 100-plus members of CEFC managed to make the complex arrangements sound both simple and beautiful. The twelve piece BPO moved effortlessly between musical genres with some great jazz soloing to boot. 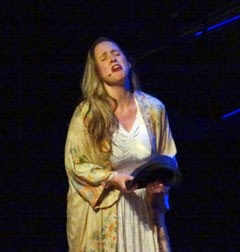 Rachel Sutton, acting and singing a number of parts showed her emotional range as a singer and actress. Holding it all together was conductor David Temple. In many ways the music and empathically scripted historical drama so ably narrated by Allan Corduner is Roland Perrin’s ode to his itinerant, secretive and enigmatic father whose life had certain, albeit less dramatic, parallels with that of Lansky. This uncompromising work shows Perrin to have a unique musical voice that merits wider recognition. It is to be hoped that this premiere will be the first of many public performances.